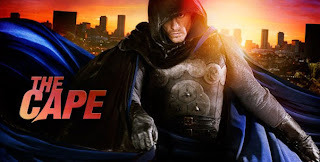 Fellowship Reviews: A review: "The Cape"
The Cape is the story of Vince Faraday (David Lyons), a second-generation cop who is wrongfully accused of a crime when he would not join a privatized police force that doesn’t have Palm city’s interests at heart. Faraday is taken in and trained by Max Malini (Keith David), a ringleader of a circus gang of criminals, several abilities that Faraday will use to end the corruption of the city and restore his good name. Orwell (Summer Glau) who is an investigative blogger assists Faraday. She’s a rip-off of Oracle (she also has the last name Simone - Bird of Prey reference?). The Cape is a clone of Batman, but it’s not that it’s a bad thing. The stories are decent so far and the visual effects are great. I like the show, but am not sure that the show will last. The whole "Batman clone" might turn some people off. It will be interesting to see the ratings for the premiere. I recommend it.